Australian researchers have discovered what is thought to be the world's oldest recorded spider, unlocking key information about the mysterious eight-legged creature. The research, published in Pacific Conservation Biology, suggests the 43-year-old Giaus Villosus trapdoor matriarch, who recently died during a long-term population study, had outlived the previous world record holder, a 28-year old tarantula found in Mexico. 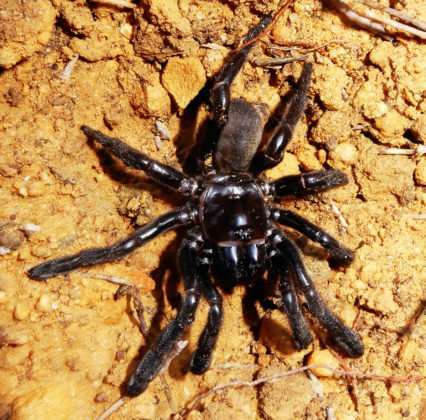 Lead author Ph.D. student Leanda Mason from the School of Molecular and Life Sciences at Curtin University said the ongoing research has led to new discoveries about the longevity of the trapdoor spider. "To our knowledge this is the oldest spider ever recorded, and her significant life has allowed us to further investigate the trapdoor spider's behaviour and population dynamics," Ms Mason said. "The research project was first initiated by Barbara York Main in 1974, who monitored the long-term spider population for over 42 years in the Central Wheatbelt region of Western Australia. "Through Barbara's detailed research, we were able to determine that the extensive life span of the trapdoor spider is due to their life-history traits, including how they live in uncleared, native bushland, their sedentary nature and low metabolisms." The team at Curtin University continued Barbara's research, now aged 88, and were able to gather information regarding the spider's age, cause of death, and a better understanding of its life history. Co-author, Associate Professor Grant Wardell-Johnson, from the School of Molecular and Life Sciences and the Deputy Director of the Australian Research Council (ARC) Centre for Mine Site Restoration (CMSR), explained how the spider's behavioural characteristics contributed to its survival in the Australian outback. "These spiders exemplify an approach to life in ancient landscapes, and through our ongoing research we will be able to determine how the future stresses of climate change and deforestation will potentially impact the species," Associate Professor Wardell-Johnson said. The recent death of the 43-year-old trapdoor spider, not only breaks the record for the world's oldest spider, but also demonstrates that long-term research is essential to understand how different species live in the Australian environment. How cool to return to a subject half the age of one's scientific carrier! tbgl, I think you meant career, not carrier.